COMMENTS:        This trigger occurred at longitude,latitude = 59.62,0.48 [deg]. COMMENTS:        This trigger occurred at longitude,latitude = 229.23,18.89 [deg]. COMMENTS:        The XRT position is 1.60 arcmin from the BAT position. COMMENTS:        The uvot_sources_image.fits.gz file does not exist; skipping the attachment. We imaged the field of GRB 090102 detected by SWIFT (trigger 338895) with the TAROT robotic telescope (D=25cm) located at the Calern observatory, France. The observations started 40.8s after the GRB trigger (6.8s after the notice). The elevation of the field decreased from from 68 degrees above horizon and weather conditions were good. OT was R~15.3 at about 100s after GRB. N.B. Galactic coordinates are lon=189.8804 lat=+34.6651 and the galactic extinction in R band is 0.1 magnitudes estimated from D. Schlegel et al. 1998ApJ...500..525S. Dec(J2000) = +33d 05' 29"
with an uncertainty of 3 arcmin (radius, 90% containment, including systematic uncertainty). The BAT light curve showed a multi-peaked structure with a duration of about 30 sec starting about 15 sec before the trigger. The peak count rate was ~7000 counts/sec (15-350 keV), at ~2 sec after the trigger. Dec(J2000) = +33d 06' 51.1"
with an uncertainty of 6.1 arcseconds (radius, 90% containment). This location is 94 arcseconds from the BAT onboard position, within the BAT error circle. No event data are yet available to determine the column density using X-ray spectroscopy. with a 90%-confidence error radius of about 1.10 arc sec. This position is 4.8 arc sec. from the center of the XRT error circle. The estimated magnitude is 18.11. No correction has been made for the expected extinction corresponding to E(B-V) of 0.05. The robotic 60-cm REM telescope located at La Silla (Chile) observed automatically the field of the GRB 090102 (Mangano et al. GCN8762) starting about 35s after the burst (26s after the alert). We detect a bright object in our first R- and H-band images consistent with the optical counterpart identified by UVOT (Mangano et al. GCN8762) and TAROT (Klotz et al. GCN 8761). The object is approximately R~14.2 (relative to nearby USNO-B1 stars) and H~12 (relative to nearby 2MASS stars) at about 1min after the burst. We analyzed images of GRB 090102 detected by SWIFT (trigger 338895) with the TAROT at the Calern observatory, France. In our previous GCN Circ. (9761) we made a mistake in the celestial coordinates of the optical afterglow. TAROT position is compatible with UVOT (Mangano et al. GCNC 8762). The first image is trailed with a duration of 60.0s (see the description in Klotz et al., 2006, A&A 451, L39) and we detect the growth of the optical light curve that culminates at t0+60s (+/- 3s) with a brightness R=13.4 (i.e. ~40s after the end of the gamma activity). We calibrated magnitudes in R band using NOMAD1 1231-0209716 (R=13.31). Dec (J2000): +33d 06' 52.1"
This position may be improved as more data are received. The latest position can be viewed at http://www.swift.ac.uk/xrt_positions. Position enhancement is described by Goad et al. (2007, A&A, 476, 1401 http://www.swift.ac.uk/xrt_positions/Goad.pdf), the current algorithm is an extension of this method. A 45-min low-resolution spectrum was also obained (2 hours post burst). A firm upper limit of z < 2.1 can be placed on the redshift of GRB 090102 from the lack of Ly-alpha forest lines in the spectrum of the afterglow. The spectrum also displays several metal lines, including Fe II, Mg II, Mg I, Al II, Al III and C IV, at a redshift of z = 1.547. No other significant lines are visible. We therefore conclude that z = 1.547 is the redshift of GRB 090102. We have analysed 6 orbits of Swift XRT data of GRB 090102 (Mangano et al. GCN Circ. 8762), consisting of 241 s in WT mode and 6.7 ks in PC mode. The XRT observation started 393 s after the trigger. The XRT light curve is well fitted by a single power-law with slope -1.32 +/- 0.01, and if decaying at this rate the source will reach a count rate level of 0.02 counts/s after one day. The WT spectrum is well fitted by an absorbed power-law with photon index 1.7 +/- 0.1, Galactic NH = 4.0e20 cm^-2 (Kalberla et al. 2005) and intrinsic absorption column of (3.8 +/- 2.0) e21 cm^-2 at the measured redshift z = 1.547 (De Ugarte Postigo et al. GCN Circ. 8766). The average observed [unabsorbed] flux during the WT observation is 6.2e-10 [7.2e-10] erg cm^-2 s^-1. The PC spectrum, extracted from about T+630 s to T+25 ks, is also well fitted by an absorbed power law with photon index 1.8 +/- 0.1, Galactic NH = 4.0e20 cm^-2 and and intrinsic NH = (7.0 +/- 2.0) e21 cm^-2 at z = 1.547. The average observed [unabsorbed] flux during the PC observation is 2.8e-11 [3.5e-11] erg cm^-2 s^-1. The rate to flux conversion factor is 1.3e-10 erg cm^-2 counts^-1. This is an official product of the Swift XRT team. Based on its bright multiwavelength emission and good sun angle, the Swift team declares GRB 090102 to be a burst of interest to be followed by Swift to late time. We encourage ground based follow-ups and cooperation of the scientific community in revising Swift observation plans according to results. Please post your results / plans or send us informal information. Dec(J2000) = +33d 06' 25.7"
with an uncertainty of 1.4 arcmin, (radius, sys+stat, 90% containment). The partial coding was 6%. The mask-weighted light curve shows approximately 4 overlapping peaks starting at ~T-14 sec, peaking at ~T+2 sec, and ending at ~T+15 sec. T90 (15-350 keV) is 27.0 +- 2.2 sec (estimated error including systematics). The time-averaged spectrum from T-13.9 to T+18.7 sec is best fit by a simple power-law model. The power law index of the time-averaged spectrum is 1.36 +- 0.08. The fluence in the 15-150 keV band is 6.8 +- 0.3 x 10^-6 erg/cm2. The 1-sec peak photon flux measured from T+1.68 sec in the 15-150 keV band is 5.5 +- 0.8 ph/cm2/sec. All the quoted errors are at the 90% confidence level. P.A. Curran (UCL-MSSL), V. Mangano (INAF-IASF PA) and S.T. Holland (GSFC) on behalf of the Swift/UVOT team. The Swift Ultra-Violet/Optical Telescope (UVOT) began settled observations of the Swift localised GRB 090102 (#338895; Mangano et al., GCN 8762) ~400 seconds after the BAT trigger. The detection in u along with the limits in uvw1 and bluer is consistent with a redshift of approximately ~1.8 < z < ~2.5 and with the spectroscopic redshift suggested by de Ugarte Postigo et al. (GCN 8766). The values quoted above are in the UVOT photometric system (Poole et al. 2008, MNRAS, 383, 627). They are not corrected for the expected Galactic extinction corresponding to a reddening of E(B-V)=0.047 mag in the direction of the burst (Schlegel et al. 1998). GROND (Greiner et al. 2008, PASP 120, 405), mounted at the 2.2m ESO/MPI telescope at La Silla Observatory (Chile),started observations of the field of GRB 090102 (Mangano et al. 2008, GCN #8762) in g'r'i'z'JHK at 05:25 UTC, 2.50 h after the burst. Preliminary photometry yields the following r' band magnitudes of the optical afterglow (Klotz et al., GCN #8761, and also GCNs #8762, #8763, #8764, #8766 and #8770), calibrated against SDSS field stars. The quoted error is statistical only. There is an additional systematic error in the absolute calibration using SDSS field stars which is expected to be in the 0.05 mag range. In this time interval, the light curve is well described with a single power law of index 1.0 +/- 0.1, compatible with the value reported by Curran et al. (GCN #8770). Comparing against the early TAROT data (Klotz et al., GCN #8764), this indicates a flattening of the light curve. If the afterglow continues to decline with this power law, we predict r' band magnitudes of ~23.1 at 1 day and ~24.3 at 3 days after the burst. After correcting for a Galactic foreground extinction corresponding to a reddening of E_(B-V)=0.05 (Schlegel et al. 1998), the g' to K band SED is well described with a power law of spectral index beta = 1.0 +- 0.2. We have observed the field of GRB090102 (Mangano et al., GCN 8762) from the IAC80 telescope at Iza=F1a Observatory in Tenerife (Spain). A 6x300s combined exposure with mean epoch 2.92 Jan 2009 (19.2h after the burst) shows the afterglow (Klotz et al., GCN 8761) with R=3D22.6+/-0.3, as compared to stars of the UNSO-B1.0. This is consistent with the prediction of Afonso et al. (GCN 8771) for day 1. We have imaged the field of GRB090102 (Mangano et al., GCN 8762) with the automated Palomar 60-inch telescope beginning at 03:46 on 2 Jan 2008 UT (~ 50 min after the burst). Observations were taken in the R, i', and g' filters and continued throughout the night until sunrise roughly 10 hours later. Photometric calibration was performed relative to the SDSS DR7, with photometric transformations from Jordi, Grebel, & Ammons (A&A, 460, 2006). In addition, we have obtained a single 1800 s spectrum of the afterglow with the Double Beam Spectrograph mounted on the Palomar 200" Hale telescope at a mean epoch of Jan 2.22. The spectrograph was configured to provide wavelength coverage from the atmospheric cutoff to ~ 8000 A. We confirm the results of de Ugarte Postigo (GCN 8766), finding a single strong absorption system at z = 1.546. Given the lack of strong Ly-alpha absorption, we place a slightly stricter limit on the host redshift of z < 1.9. "Starting on 2009 January 2.24 UT we used the Marcario LRS spectrograph on the Hobby-Eberly Telescope (R ~ 230) to obtain a 1000s spectrum of the optical afterglow of GRB 090102 (Mangano et al., GCN 8762, Covino et al., GCN 8763). The spectrum covers the wavelength range 4200 to 10,000 Angstrom. Unfortunately the data were taken under bad seeing conditions and the average S/N is ~5. Based on a preliminary calibration we detect some absorption features which we identify as the MgII doublet (2796,2803) and MgI(2856) at redshift z = 1.55. This value is consistent with the redshift reported by de Ugarte Postigo et al. (GCN 8766) and Cenko et al. (GCN 8773). We thank the HET staff for performing this observation, in particular John Caldwell." The long GRB 090102 (Swift-BAT trigger #338895: Mangano et al., GCN 8762; Sakamoto et al., GCN 8769) triggered Konus-Wind at T0=10536.283 s UT (02:55:36.283). The burst light curve shows a multipeaked structure with a duration of ~30 s.
As observed by Konus-Wind the burst had a fluence of 3.09(-0.25, +0.29)x10^-5 erg/cm2, and a 256-ms peak flux measured from T0+12.016 s of 5.10(-0.72, +0.74)x10^-6 erg/cm2/s (both in the 20 keV - 2 MeV energy range). The time-integrated spectrum of the burst (from T0 to T0+33.024 s) can be fitted (in the 20 keV - 2 MeV range) by a power law with exponential cutoff model: dN/dE ~ (E^alpha)*exp(-E*(2+alpha)/Ep) with alpha = -0.86(-0.13, +0.14), and Ep = 451(-58, 73) keV (chi2 = 48.8/65 dof). Fitting by GRB (Band) model yields the same alpha and Ep, and only an upper limit on the high energy photon index: beta < -2.73 (chi2 = 68.8/64 dof). Assuming z = 1.547 (de Ugarte Postigo et al., GCN 8766) and a standard cosmology model with H_0 = 70 km/s/Mpc, Omega_M = 0.27, Omega_\Lambda = 0.73, the isotropic energy release E_iso ~1.9x10^53 erg, the peak luminosity (L_iso)_max ~ 7.8x10^52 erg/s, and Ep_rest ~1100keV. We observed the field of GRB 090102 detected by Swift (trigger #338895; Mangano et al., GCN #8762) with the 14-inch Goddard Robotic Telescope (GRT) located at the Goddard Geophysical and Astronomical Observatory (http://cddisa.gsfc.nasa.gov/ggao/). Ten set of 5 sec and five set of 10 sec and 30 sec exposures were taken in the R filter starting from Jan. 2 03:11:58 (UT) about 16.2 min after the trigger. We do not detect the optical afterglow (Klotz et al., GCN #8761, Mangano et al., GCN #8762) both in the individual images and the combined image. The estimated three sigma upper limit of the combined image (total exposure of 250 sec) is ~17.9 mag using the USNO-B1 catalog. "We used the Very Large Array to observe the field of view toward GRB 090102 (GCN 8762) at a frequency of 8.46 GHz on 2009 Jan 03.35 UT. The GRB radio afterglow is undetected at 3-sigma level. The flux density at the Swift UVOT afterglow position (GCB 8762) is 91 +/- 49 uJy. The National Radio Astronomy Observatory is a facility of the National Science Foundation operated under cooperative agreement by Associated Universities, Inc."
We observed the afterglow of GRB 090102 (Mangano et al., GCN 8762; Klotz et al., GCN 8762) with the Nordic Optical Telescope equipped with ALFOSC, at several epochs. The decay in the R band is consistent with a single power law with slope alpha ~ 0.9 between 0.1 and 3 days after the GRB. This is in agreement with the early-time slopes reported by Afonso et al. (GCN 8771) and Cenko et al. (GCN 8773). There is marginal indication that the light curve may flatten at late times, which could be due to the presence of a host galaxy. Further observations are encouraged. "We observed the position of the GRB 090102 afterglow at 4.9 GHz with the Westerbork Synthesis Radio Telescope at January 8 18.88 UT to January 9 6.86 UT, i.e. 6.66 - 7.16 days after the burst (GCN 8762). We do not detect a radio source at the position of the optical counterpart (GCN 8766). The three-sigma rms noise in the map around that position is 72 microJy per beam. The formal flux measurement for a point source at the position of the optical counterpart is 12 +/- 24 microJy. We would like to thank the WSRT staff for scheduling and obtaining these observations." The MAGIC Imaging Atmospheric Cherenkov Telescope performed a follow-up observation of GRB090102 (Mangano et al., circular 8762). We started data taking with MAGIC at 03:14:52 UT under excellent observation conditions. The observation continued for 13149 s.
No evidence for VHE gamma-ray emission above a (preliminary) analysis threshold of 89 GeV was found. Further analysis, exploiting the recently upgraded event trigger, is still underway for energies below 80 GeV. GCN_Report 192.1 has been posted: http://gcn.gsfc.nasa.gov/reports/report_192_1.pdf by V. Mangano at INAF ISAF Pa titled: "Final Swift Observations of GRB 090102"
We observed the afterglow of GRB 090102 (Mangano et al. GCN 8762; Klotz et al. GCN 8761) using the Hubble Space Telescope and Wide Field Planetary Camera on the 26th Jan 2009. Observations were obtained over 3 orbits (6400s), using the F606W filter. At the location of GRB 090102 we find an obvious host galaxy underlying the GRB afterglow. The magnitude of the combined afterglow+ host at this time is R~24.5 (AB). Astrometry utilizing early images obtained at the NOT (de Ugarte Postigo et al GCN 8766) shows that the location of GRB 090102 is consistent with the centroid of the galaxy/afterglow combined light (offset = 0.09 +/- 0.06"). This suggests that the afterglow may still be contributing significantly at the current epoch. Estimates of the magnitude of any likely point source coincident with this are inevitably uncertain, but do allow for a continued decay with temporal index alpha~1. Later time observations are planned, and will allow an accurate subtraction of the host galaxy light. University of Ferrara) The nature of the jets and the role of magnetic fields in gamma-ray bursts (GRB) remains unclear. In a baryon-dominated jet only weak, tangled fields generated in situ through shocks would be present. In an alternative model, jets are threaded with large scale magnetic fields that originate at the central engine and which accelerate and collimate the jets. The way to distinguish between the models is to measure the degree of polarization in early-time emission, however previous claims of gamma-ray polarization have been controversial. Here we report that the early optical emission from GRB 090102 was polarized at the level of P=10+/-1%, indicating the presence of large-scale fields originating in the expanding fireball. If the degree of polarization and its position angle were variable on timescales shorter than our 60-s exposure, then the peak polarization may have been larger than 10 per cent. We have developed a new method, close in philosophy to the photometric redshift technique, which can be applied to spectral data of very low signal-to-noise ratio. Using it we intend to measure redshifts while minimising the dangers posed by the usual extraction techniques. GRB afterglows have generally very simple optical spectra over which the separate effects of absorption and reddening in the GRB host, the intergalactic medium, and our own Galaxy are superimposed. We model all these effects over a series of template afterglow spectra to produce a set of clean spectra that reproduce what would reach our telescope. We also model carefully the effects of the telescope-spectrograph combination and the properties of noise in the data, which are then applied on the template spectra. The final templates are compared to the two-dimensional spectral data, and the basic parameters (redshift, spectral index, Hydrogen absorption column) are estimated using statistical tools. We show how our method works by applying it to our data of the NIR afterglow of GRB090423. At z ~ 8.2, this was the most distant object ever observed. We use the spectrum taken by our team with the Telescopio Nazionale Galileo to derive the GRB redshift and its intrinsic neutral Hydrogen column density. Our best fit yields z=8.4^+0.05/-0.03 and N(HI)<5x10^20 cm^-2, but with a highly non-Gaussian uncertainty including the redshift range z [6.7, 8.5] at the 2-sigma confidence level. Our method will be useful to maximise the recovered information from low-quality spectra, particularly when the set of possible spectra is limited or easily parameterisable while at the same time ensuring an adequate confidence analysis. Since the launch of the Fermi~Gamma-ray~Space~Telescope on June 11, 2008, 55 gamma-ray bursts (GRBs) have been observed at coordinates that fall within 66^\circ of the Fermi Large Area Telescope (LAT) boresight with precise localizations provided by the NASA Swift mission or other satellites. Imposing selection cuts to exclude low Galactic latitudes and high zenith angles reduces the sample size to 41. Using matched filter techniques, the Fermi/LAT photon data for these fields have been examined for evidence of bursts that have so far evaded detection at energies above 100 MeV. Following comparisons with similar random background fields, two events, GRB 080905A and GRB 091208B, stand out as excellent candidates for such an identification. After excluding the six bright bursts previously reported by the LAT team, the remaining 35 events exhibit an excess of LAT "diffuse" photons with a statistical significance greater than 2 sigma, independent of the matched filter analysis. After accounting for the total number of photons in the well-localized fields and including estimates of detection efficiency, one concludes that somewhere in the range of 11% to 19% of all GRBs within the LAT field of view illuminate the detector with two or more energetic photons. These are the most stringent estimates of the high energy photon content of GRBs to date. The two new events associated with high energy photon emission have similar ratios of high to low energy fluences as observed previously. This separates them from bursts with similar low energy fluences by a factor of ten, suggesting a distinct class of events rather than a smooth continuum. During the last 15 years, a standard paradigm has emerged to explain both the progenitor nature and the observed radiations of gamma-ray bursts. In this work we show three GRBs for which the standard paradigm could be tested with high statistics due to their exceptional spectral and temporal coverage. While GRB 1110205 represents a very good example of the standard scenario, GRB 090102 and GRB 111209A do not fit into the standard paradigm. In the current view of Gamma-Ray Burst (GRB) phenomena, an emission component extending up to the very-high energy (VHE, E > 30 GeV) domain is though to be a relatively common feature at least in the brightest events. This leads to an unexpected richness of possible theoretical models able to describe such phenomenology. Hints of emission at tens of GeV are indeed known since the EGRET observations during the '90s and confirmed in the Fermi-LAT data. However, our comprehension of these phenomena is still far to be satisfactory. In this respect, the VHE characterization of GRBs may constitute a breakthrough for understanding their physics and, possibly, for providing decisive clues for the discrimination among different proposed emission mechanisms, which are barely distinguishable at lower energies. The current generation of Cherenkov observatories, such as the MAGIC telescopes, have opened the possibility to extend the measurement of GRB emission, and in general to any short time-scale transient phenomena, fromfew tens of GeV up to the TeV energy range, with a higher sensitivity with respect to gamma-ray space-based instruments. In the near future, a crucial role for the VHE observations of GRBs will be played by the Cherenkov Telescope Array (CTA), thanks to its about one order of magnitude better sensitivity and lower energy threshold with respect to current instruments. In this contribution, we present a method aimed at providing VHE detection prospects for observations of GRB-like transient events with Cherenkov telescopes. 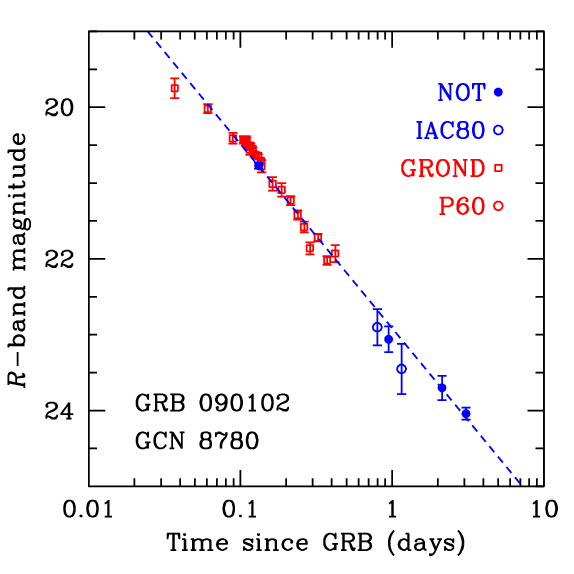 In particular, we consider the observation of the transient event GRB 090102 as a test case for the method and show the achieved detection prospects under different observational conditions for the MAGIC telescopes and CTA.